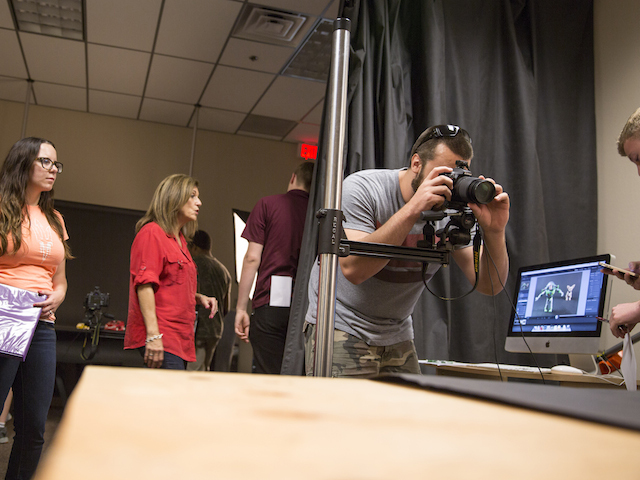 In the GIT Commercial Photography Studio, students work with professional quality equipment and produce photo shoots for ASU clients. Photographer: Jessica Hochreiter/ASU. The Graphic Information Technology program at Arizona State University is preparing students to creatively present information in the ever-changing graphics industry. “We graduate creative technologists who use both their left and right brains,” said Penny Ann Dolin, associate professor of practice and chair of the program. “They have the creative knowledge and also understand production value. When our students build a website, it has to look good, and, it has to work. 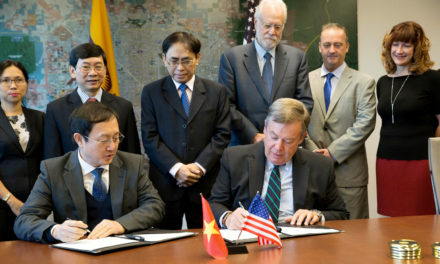 The program, which started in 1958, was the first to move to ASU’s East campus, now the Polytechnic Campus, and one of the first to build online courses. 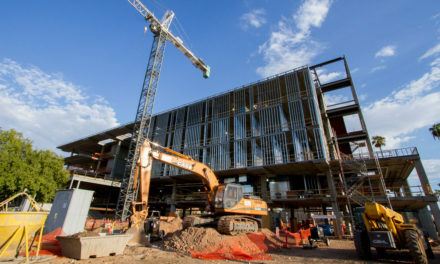 It is part of the Polytechnic School, one of ASU’s Ira A Fulton Schools of Engineering. It has eight faculty members and 650 students. “Graphic Information Technology encompasses communication and graphical presentation very broadly: web, photo, multimedia, visual and print,” said Ann McKenna, professor and director of the Polytechnic School. Students have a variety of experiences, including working with engineering students in the eProject program and Innovation Showcase, creating posters, handouts and other collateral to tell their story. “It’s part of the ‘poly’ nature of the program,” McKenna said. “All technical challenges are interdisciplinary. In engineering, you need to be able to explain your ideas and designs. Engineering plays a critical role in technical solutions and the Graphic Information Technology program helps advance the message through design. McKenna said students have a highly engaged faculty and access to the latest technology through opportunities like the Print and Imaging Lab, a professional print service run by students that serves ASU and other clients. In addition, there is the GIT Commercial Photography Studio where students work with professional quality equipment and produce photo shoots for ASU clients. Spring 2015 will see the opening of the The Device and Usability Lab, a collection of computers, mobile phones, tablets and other devices available for website testing and usability research. McKenna said the Polytechnic Campus is expanding the Make Media Lab, where students work with video services. Graduates are in high demand, often having multiple job offers. They have gone to work for companies from Amazon, Adobe, BlueMedia and GoDaddy to Leo Burnett, one of the largest advertising agencies in the world. Students work in communications departments for large corporations, like US Airways, American Express, GM, Exxon and Kodak. They also work for boutique graphic design companies, start their own firms, and go on to graduate school to be able to teach. Ross Greenblat, who graduated in 2010, now works as a producer at Leo Burnett, Chicago, one of the largest advertising agencies in the world. He decided he wanted a career in graphic information technology when he was a junior at Adlai E. Stevenson High School in Lincolnshire, Ill., a suburb of Chicago. His graphics class took a fieldtrip to Graph Expo, a trade show in Chicago where the printing industry shows off new technology. “It was an eye-opening experience to see the scale of the industry and the equipment involved,” Greenblat said. He told his teacher he wanted to pursue a degree in graphic communication, and wanted to go to a large university. His teacher suggested Clemson University and Cal Poly, but also mentioned a friend, Thomas Schildgen, a professor at ASU who was chair of the GIT program at the time. Greenblat visited ASU and decided it was a good fit. He planned on working as a commercial printer, and during his sophomore year, interned in the Print and Imaging Lab. But one day, a representative from Leo Burnett came to speak. “After hearing what she had to say and speaking with her at length about the advertising industry, and specifically Leo Burnett, I knew that was the industry that I wanted to go into,” Greenblat said. He interned there summers after his sophomore and junior years, and upon graduation was hired as a sourcing analyst, then became an associate producer and currently is a producer, creating content for clients, including print, radio and TV commercials. “For a TV commercial, that means finding a director and production company to shoot the commercial, handling the casting of any applicable talent, being on set and making sure that the creative team and client’s interests are being addressed,” Greenblat said. “Once the shoot is wrapped, we work with a post production company to edit the commercial, then work with music, motion graphics, color and audio companies to turn the materials from the shoot into a finished commercial. Greenblat said the GIT program helped expand his knowledge of the graphic communications industry, including the management side and how to communicate with internal teams, as well as clients. Ralston said the courses are broad-based to give students a sampling. “Students come in with one idea of what they want to do, but get a taste of everything,” Ralston said. “One might be interested in photography, then try video and become obsessed. Or they might work in the print lab and decide they love the unique and unusual ways to handle print projects. In one of Ralston’s courses, students are told to design, print and assemble a box, and she’s considering a course in packaging. In the future, Ralston sees the program continuing to add to the curriculum, including packaging design, large-format design, the creative-agency experience, and more video. “We’re always looking for ways to push the envelope of what technology can do for us,” Ralston said. Because the technology is always changing, Dolin said the emphasis is on learning to learn. Because many students will set up their own companies, the program also addresses business issues. “We put an emphasis on business, talking about negotiation, copyright, digital rights management, how to decide what to charge,” she said. In the future, ASU hopes to expand the program to have 800 to 1,000 students. Faculty continue to look for the next major advances in technology. “We’re always watching what’s coming next,” said Dolin, who had a full commercial photography studio in Stamford, Connecticut. She started her career as a photojournalist in New York, shooting for the New York Times, Newsday and other major publications. “I remember rushing into the city and running down 43rd Street to physically deliver my film to the Times. Digital arrived in the mid to late ‘90s and upended everything. “This past week, they installed the largest digital billboard in Times Square, a block long in New York City. There’s wearable technology, headset displays, responsive design. We’ve had desktop, laptop, iPhone, iPad, now the iWatch. I’m convinced holography will have its day soon.